Regina, The Evil Queen from 'Once Upon a Time' stopped by the Magic Kingdom's New Fantasyland last week, looking to extend her rule beyond the realm of Storybrooke. Lana Parrilla, who stars as the Evil Queen/Regina Mills on the hit ABC series, was at the park to film a promo for New Fantasyland. The promo aired May 5 during Once Upon a Time and featured Regina as she thought about taking over as the Evil Queen of New Fantasyland. 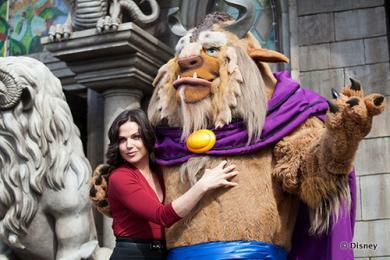 Take a peek at this behind-the-scenes video of Parrilla's visit, courtesy of the Disney Parks Blog. It looks like she had some magical encounters with The Beast and Gaston. Did you catch the spot on last Sunday's 'Once Upon a Time'? What did you think? Oh that is so cool. To be honest I haven't caught a lot of it. I think I will have to On Demand the show if it is available. I thought the commercial was adorable! The show is great and the commercial was terrific!